let's hope the good playing from man city follows to this match. same lineup sans walcott. in current form i would accept a draw no doubt, just get some points and move on. I can't see Lookman starting Silva won't change the 1st line up that looked like they could do something for along time. 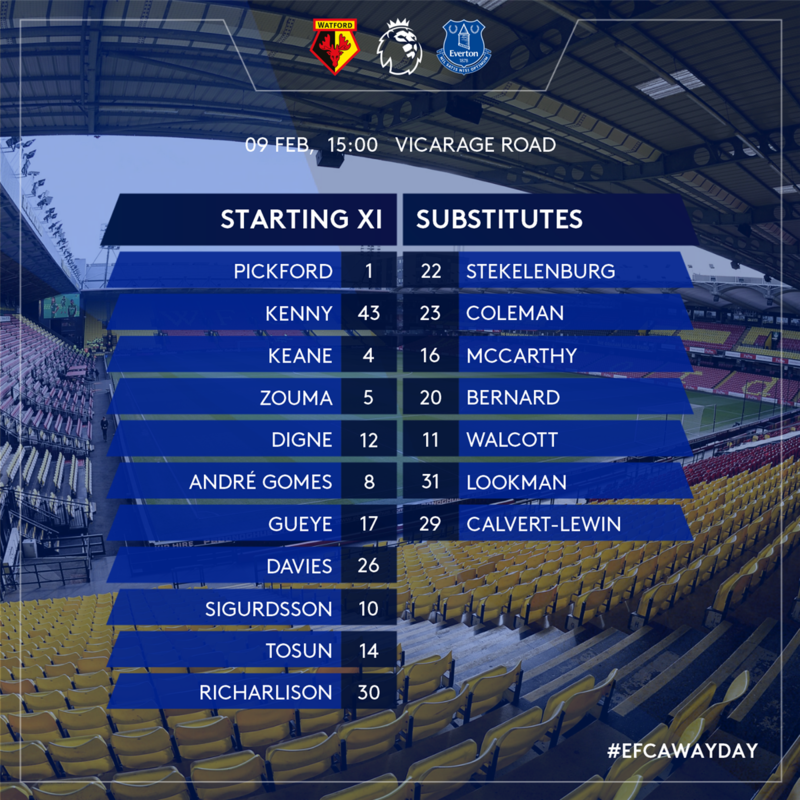 I can't see Lookman starting Silva won't change the 1st line up that looked like could do something for along time. Can see richarlison coming onto the left and Bernard right. Walcott was absolutely rubbish. I hope he keeps the midfield 3. Definitely just to see if it is a midfield trio with some mileage in it that can improve with more games together. He should definitely keep the midfield 3, but Walcott for me should be nowhere near the starting line-up. Bring on Richarlison or Lookman and otherwise unchanged. Lookman has done very little for me, he's shown a few moments of trickery now and again but absolutely no finished product, Richarlison back on his own wing and Bernard in place of Walcott. would be my only changes. 4 3 3 with no Walcott or Sig please chief. I haven't seen a massive amount of Watford this season but with those two in central midfield they are very physical. Deeney wont give an inch and Deulofeu we all know can do something magical. If we try and go 2 v 2 in midfield we will lose. Gana needs to play in front of the CBs and stop Deeney getting easy control of the ball and stop Geri running at the CBs. I would guess that means Siggy wide right? I’m confused and I really hope Gylfi has a blinder for Marco’s sake. Glad he reacted to Walcott horror show. Gylfi tucks in off the right to support Cenk. In theory love the change, let’s see if it comes off. 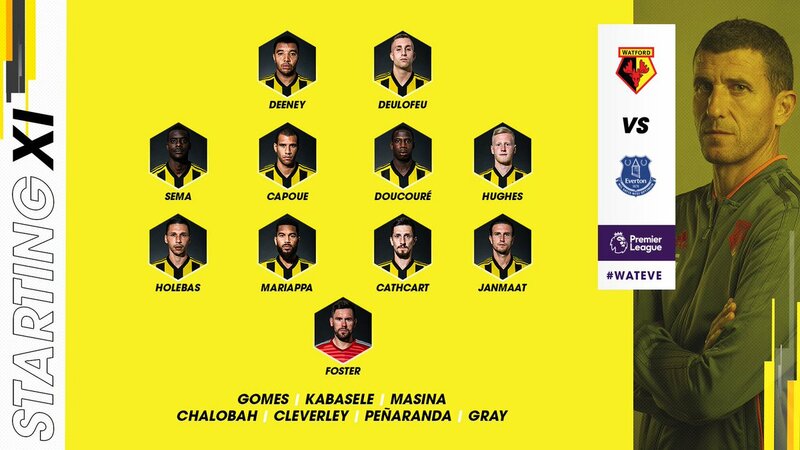 I'd imagine its a diamond with Richarlison and Tosun leading the line. Interesting... I hadnt thought of that. It would definitely he a move away from the norm. I'm not against him playing in that position either *as long as* the design is that he has players around him to link up with. If he just gets hung out there then it wont work. Will it be any good?! Anybody find a working stream for this yet? Could use a friendly DM if so. Wouldn’t mind one if any can find. Will pm you if I find one too. Echo live updates say Siggy is on the left if anyone can confirm or deny? Keane carrying on appealing for an offside when it wasn’t instead of trying to get a challenge in. Disgraceful. Started with Gomes pulling out of a challenge in midfield. He had a good chance at the other end too. Gana too. Weak link is Gomes by far. Someone needs to give him a kick up the arse, its like its his first game of pre-season. Gana has been passing well, spreading the play abit which has been good. Gomes is a strange case - playing well within himself. Richarlison needs to stop play acting. Good chance there, forcing them into a mistake. I seem to remember the last time we played this lot Foster played out of his skin then too. Kenny down, he landed very awkwardly. Good defending though, Zouma in the right place. We look much better playing 433. Difficult to see where siggy has a place in this. Underrated keeper in my opinion. Seems to always make the saves he needs to and rarely does anything eratic. Siggy has every right to look at Tosun and wonder where he was there. Another good ball between the two moments later. Free kick in a bad area before half time... here we go. The combination or Richarlison, Davies and occasionally Kenny or Tosun are causing problems. More by hard work than skill. Obligatory just before half time free kick given away.
" The ball clatters it and now Everton must defend the set piece just before half time. " Wheeeeeyyy it didnt go in! Wheeeey that didnt go in either! Gana sleeping and while Im not sure who should have been the man marking Geri, Digne gets a great block in. We actually look to be showing a bit of chemistry, spirit and understanding in attack, nice to see a bit of growth for once. A proper centre forward and we are in the game here. Tosun for all his efforts is just left wanting. Quite big contact in the air but Pickford has to keep hold of that. Not terrible. Keane is still useless but we can't have everything. Very solid half. The game is very much in the balance and if we could just get this first goal it could be huge for us. Not good but not bad. The problem is that we don’t look much like scoring. All our chances have been half chances with comfortable saves from Foster, the best one probably coming from the glancing header by Zouma. Tosun is working hard and creating but every shot he’s taken has been directly at Foster.